Though summer movie season is in full swing, and it seems like we'll never again see a movie that isn't intended to kick off a franchise, the fall is coming quickly, and with it all those quiet, intellectual movies that are as much a relief as the first sub-60-degree day. One of the most exciting movies on the fall roster, for me at least, is Tinker Tailor Soldier Spy, the adaptation of John le Carre's spy novel that features a murderer's row of British acting talent. 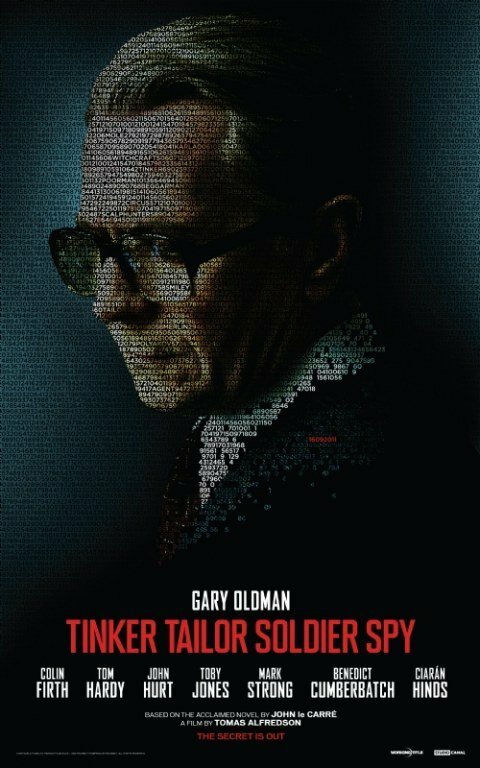 Gary Oldman tops the list, and it goes on to include Colin Firth, Tom Hardy, John Hurt, Toby Jones, Mark Strong, Benedict Cumberbatch and Ciaran Hinds-- and those are just the names that made the poster. See those tiny red digits on Oldman's shoulder? That's the UK release date-- September 16-- hidden in plain sight. The text also includes names of characters and numbers that apparently point to plot clues, though since I'm hoping to know as little as possible going into this, I'm not going to try and decipher them. You can learn more about the film by watching the killer first trailer or just wait patiently until November 11, when it finally sees release in the United States. I have a hunch, though, that it might make the festival rounds before then-- if I run into it at the Toronto Film Festival in September, I'll be both unsurprised and totally delighted.